but it’s worth a second look. -- first published in "The Chronicle Connection"
the seven-day trip across the Andes Mountains on horseback from Chile to Argentina. 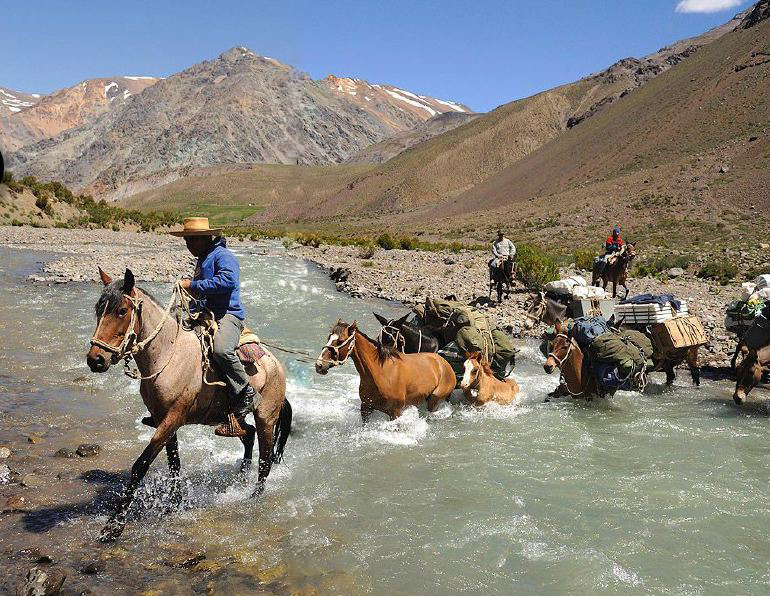 Following the historic trail Jose San Martin and his army rode in 1817 when they liberated Chile from Royalist rule, native Criollo horses transport you across rushing rivers, navigate narrow ridges and zig-zag up steep pitches reaching altitudes of 4,500 meters. Yellow, red and blue flowered valleys welcome you into the mountains while enormous condors soar overhead, and guanacos (wild llamas) run freely beside the trail. We team up with excellent local guides and a number of gauchos to transport you back in time. Each day, mules haul provisions to a new camp under the stars, where you’ll enjoy meals cooked over an open fire and accompanied by some of Argentina’s most favored Malbec wine. With spectacular vistas and constantly changing ecosystems, combined with true Argentinean hospitality, this vacation is one of the most unique adventures one can enjoy on horseback.